None of the German Lander implemented the RDR Article 44 (establishment of new agroforestry on agricultural land), but there appear to be 3 active research projects. The University of Friburg conducted a project called the ‘Agroforst Cooperative Project; with funding from Federal Ministry of Education and Research (BMBF). It evaluated a number of management methods in Baden-Württemberg and Mecklenburg-Vorpommern. The project started on April, 1st 2005 and finished September 30, 2008. More details are available here. A project has recently started at the Technical University of Munich to examine the potential of agroforestry (including traditional systems such as orchards and modern systems such as alley cropping) to examine the opportunities to integrate wood, food, C-sequestration and energy production with nature conservation. Funding is provided by the Federal office for Nature Conservation and the project runs from 11/08 to 10/10. Policy recommendations will be made to the Federal Government for improvements in both carbon-trading and agri-environmental legislation. Recommendations for legal, financial and planning instruments are envisaged. More information is available here. A project on ‘short-rotation coppice agroforestry systems’ has recently started at the Thuringer Landesanstalt fur Landwitrshaft. No website yet. The third project was described at a very interesting workshop in Jena in May 2009 titled ‘Forum Agroforstsysteme’. 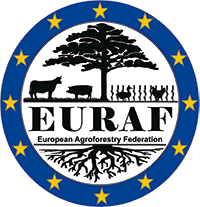 Other presentations (only in German) at this workshop included: bioenergy in Thuringia; the legal framework for agroforestry; wood-energy and agroforestry systems; targets for German resources; overview of agroforest systems in Europe (SAFE project); economic and ecological evaluation of agroforestry systems; strip cultivation of fast growing species; economic and environmental aspects of tree strips for landscaping and erosion protection; the value of timber in agroforestry systems; wood-energy – opportunities and risks from the perspective of environmental protection; energy wood from plantations or agroforestry – a comparative perspective; field visits to energy and agroforestry plots in Dornburg. Full information is here and here . Comments are invited from colleagues in Germany.